Alexandre Lacazette scored in yet another home game for Arsenal this afternoon, as the French international gave the Gunners the lead against Southampton at the Emirates. 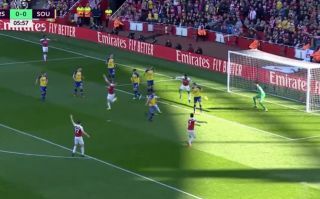 The goal came after a cross into the box found its way to Henrikh Mkhitaryan, whose shot-come-cross found its way to Lacazette, who put the ball home to open the scoring in north London. This was the fourth home league game in a row that Lacazette had scored in for Arsenal, meaning that he became the first player since Robin Van Persie in the 2011/12 season to achieve such a feat. You can check out Lacazette’s goal here. Bit lucky, but he’ll take it!